Who is Simply Vegan aimed at and what is the magazine’s mission? Simply Vegan is all about making veganism easy and accessible. Covering food and lifestyle, it is packed with simple recipes that don’t require odd ingredients or take too long to prepare, as well as supermarket taste tests, reviews of high street restaurants and cafés, plus beauty reviews, fashion, and nutrition basics. It’s everything a new vegan needs to guide them through their new lifestyle. Veganuary encourages people to try vegan for January, promoting veganism as a way to help the planet, reduce the suffering of animals and improve personal health. How is Simply Vegan advocating this message? We are so excited to now be an Official Supporter of Veganuary – it’s a fantastic charity that shares our vision and goal to help people enjoy trying veganism for the first time. We work alongside experts at Veganuary to provide tips on everything from what to eat and what supplements to consider, to vegan fashion and environmental issues. 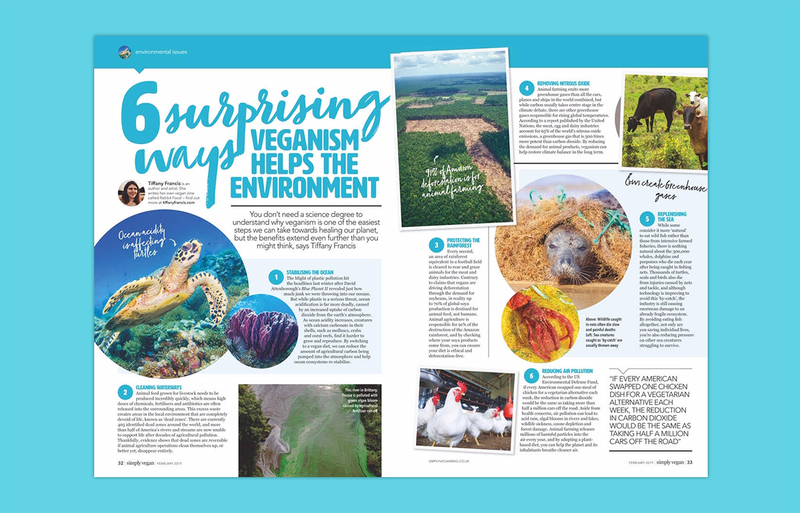 For people wanting to explore veganism, how does the magazine help to start and support their journey? Here at Simply Vegan we understand that trying veganism can feel a little daunting at first. Some people worry that they’re not getting the right nutrients in their new diet, whilst others encounter negative comments from friends or family who sometimes struggle to understand what appears to be a radical change. Our features, written by vegan bloggers, nutritionists and dietitians from organisations such as The Vegan Society, all focus on giving our readers the information they need to get started and to ultimately continue their plant-based journey in way that’s positive and enjoyable. There are over 30 delicious recipes in every issue, which have been most popular with readers? Our midweek meals are always a winner – whether you’re a student, a professional, a parent or all three, everyone wants quick, easy yet healthy dishes. 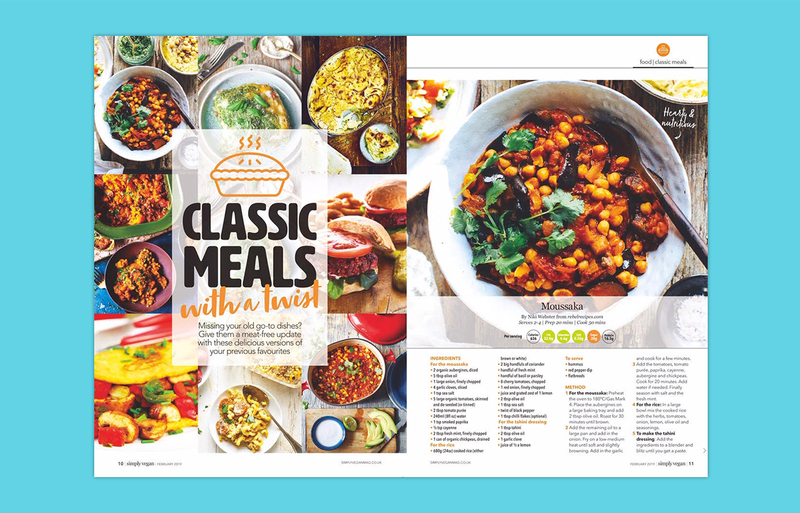 One pots like chilli, curry or noodles are great because they are so easy to prepare and you can pack in loads of veg; the stuffed butternut squash in our Christmas issue also received rave reviews! Many of our recipes are from top vegan chefs and influencers, such as Gaz Oakley, The Happy Pear, Katy Beskow and Lucy Watson who know what new vegans are looking for. There are vegan stereotypes around such as vegans being hungry and having limited choice, how does Simply Vegan quash this view? There’s a revolution taking place in the food industry – and indeed society as a whole – right now and the success of Simply Vegan is testament to this shift in people’s attitude. We are all realising that we need to make more ethical choices when it comes to our diets and our lifestyles. In response to this, the supermarkets and restaurant chains are constantly releasing new vegan ranges to keep up with growing demand. Since I started as editor last August, Sainsbury’s, Morrisons, M&S, Tesco and Asda have all launched own-brand vegan ranges that include ready meals, pizzas, cheese and plant-based milks. It’s really not hard to be vegan anymore and Simply Vegan celebrates that. 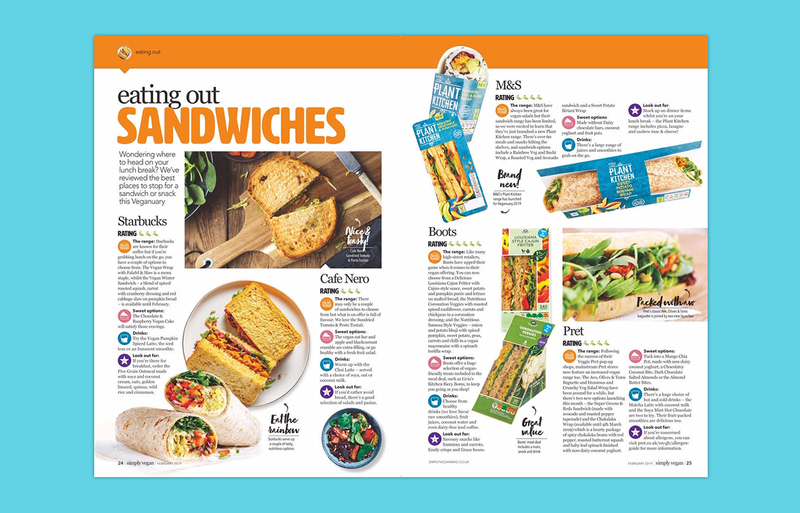 We share all these exciting developments with readers, as well as reviewing all the high-street ranges so they can easily find food they like in local shops and cafés. As a society, we still have a way to go, but as more and more people reduce their meat intake or give it up completely, the more choice will become available. Vegans don’t just eat salad – we like eating burgers and cake sometimes too! What can subscribers expect from future issues, why subscribe? Every issue will be packed with vegan inspiration from where to eat out, to simple and tasty recipes to cook at home, where to get the best vegan beauty products and all the latest news and issues facing us as vegans in the world today. You will save money with a subscription and it’s delivered direct to your door every month – no hassle! Subscribe to Simply Vegan from just £12.50 and save up to 40% for a limited time only! Happy 25th Birthday Sainsburys Magazine!